Our Flood Tapestry Panel has been growing nicely; during our free workshop sessions, community group sessions, which Donna Campbell (the projects lead textile artist) works with, in schools and also in homes. 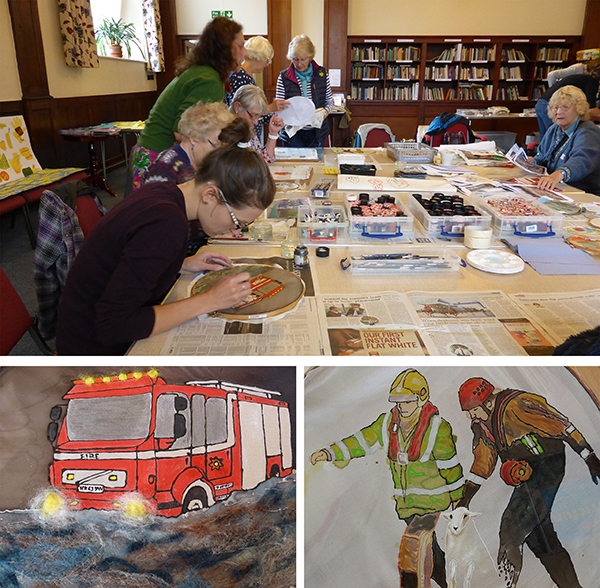 We are creating a wall hanging and stitched story of the Kendal Floods and the resilience of the community. It is a project to record the events that occurred when Storm Desmond hit Kendal in December 2015 and much of the town was flooded. However, we have been slightly panicked for the last couple of weeks, as a lovely silk painting had gone walkabout. 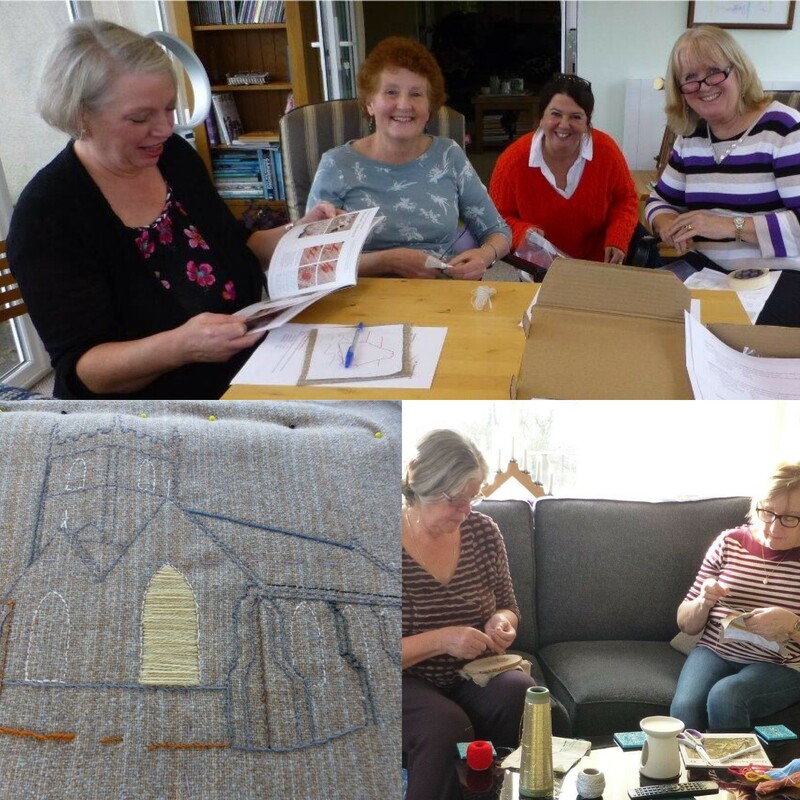 As you can imagine there is lots of work being produced in different places, as is the varied nature of a community project, all of which is treasured by Donna. Somewhere, amidst the unpacking and repacking of boxes, a beautiful silk painting of a motorcyclist dismounting his bike in flood water had vanished. Donna did a thorough check of both the art room and her vehicle before leaving the Meeting House. Searching back at her studio Donna reported back that alas it couldn’t be found anywhere. No stone had been left unturned as they say. We all felt terrible that the piece was missing, knowing the skill and time which had gone into it. Our final avenue was to ask attendees of the latest workshop if they had seen it, hoping it had been accidentally scooped up in someones own art bag. You can imagine our surprise when not only did it turn up safely but to find it had been carefully embroidered and embellished into a stunning panel detail! We’re sure you’ll agree the final results are brilliant. What a relief to have it back and looking better than ever. 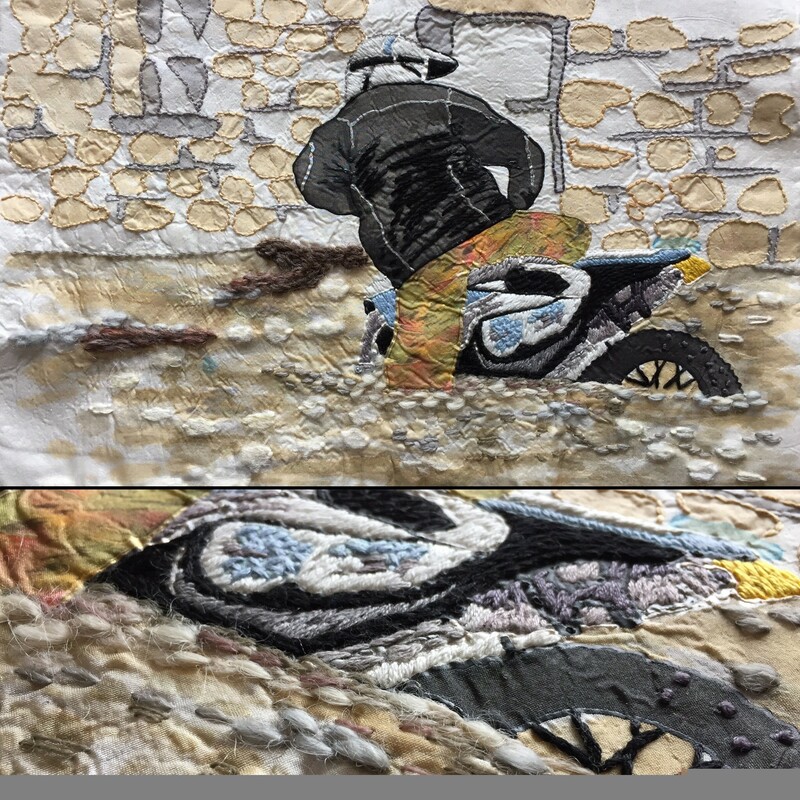 If you would like to be involved in the Flood Tapestry Panel Project visit our events page to find out when our next free community workshop will be taking place. Anyone can contribute to the community project regardless of their crafting or artistic ability as the stories people have to tell are just as valuable to this project. We aim to audio record recollections of the strength of our community in the aftermath of the flood so please get in touch if you have a story to share.